The Belgian town of Ypres, now more generally and correctly known by its Flemish name, Ieper, is very close to Britain. Geographically, it is only about an hour and a half away – through the Channel Tunnel from Folkestone to Calais, head north to Dunkirk, hang a right and you’re there. Spiritually, it’s even closer. In fact, I am sure the Belgian Government and the good citizens of Ypres will forgive me for saying that Ypres sometimes feels like a little bit of Britain. At least 185,000 British and Commonwealth servicemen died in this part of West Flanders between 1914 and 1918; about 120,000 of them remain there still, buried in land given in perpetuity by the Belgian people. When Rupert Brooke wrote – albeit maybe a little parochially – in his poem, The Soldier, “If I should die, think only this of me: that there’s some corner of a foreign field that is forever England” he could not have imagined the scale of the interment. Yet Ypres represents but a small fraction of the hideous human cost of the Great War, the War to End All Wars, and other conflicts since, which we remember every November in the abiding hope that nothing like them will ever happen again. When German military plans violated Belgian neutrality on 4th August 1914, triggering Britain’s declaration of war, no one could possibly have foreseen what the old medieval cloth town of Ypres would come to represent. The tide of the German invasion that swept almost to the gates of Paris was reversed at the battles of the Marne and the Aisne. The invaders were pushed back and in October, at the northern end of the line, the two sides came to face with each other around Ypres. Here, the tiny British Expeditionary Force found itself, sandwiched between the Belgians entrenched to the north and, to the south and as far as the Swiss frontier, the French. The Germans, quite sensibly, took up defensive positions on the very slightly higher ground surrounding the town on three sides, creating a bulge in the line, or salient. The area in and around the Salient was fought over by hundreds of thousands of men for the next four years, but Ypres itself always remained in British hands and, mostly, the Germans retained the high ground. 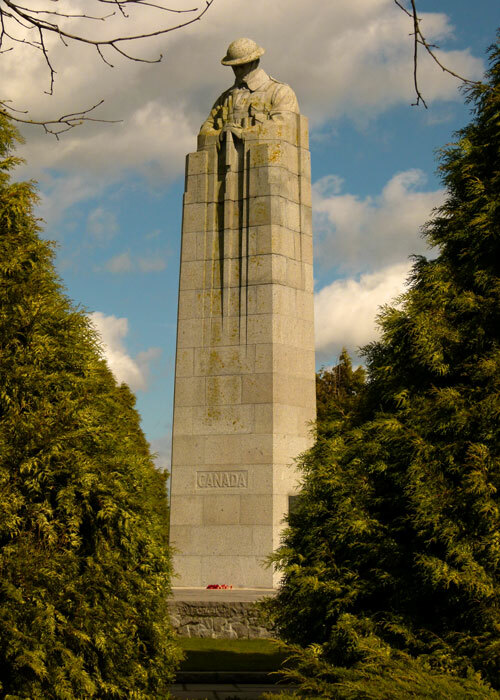 The entire Salient was an extremely dangerous place throughout that time, but on four occasions the fighting reached such intensity that each instance has been designated as a separate Battle of Ypres: the First from 19 October – 22 November 1914; the Second from 22 April – 25 May 1915; the Third from 7 June – 10 November 1917; the Fourth from 7 – 29 April 1918. 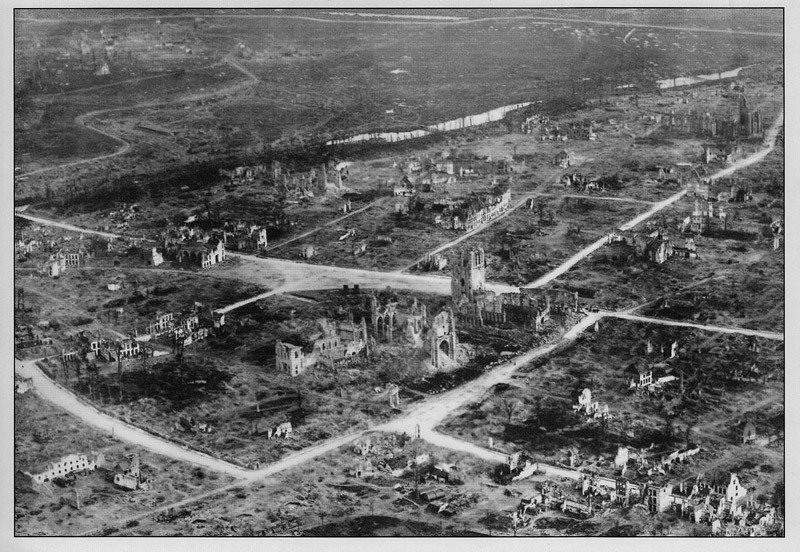 At the end of it all, very little was left of Ypres: because so few buildings were left standing, and certainly little over waist height, it was said that someone on horseback on one side of town could see clear through to the other. Throughout the Salient, communities that had existed for hundreds of years had simply disappeared; obliterated, they were merely names on maps. The land was a desolate muddy lunar landscape, pockmarked with craters, the splintered remains of trees showing where woods had once grown, tumbled walls marking where people had once lived. But the second phase of Third Ypres in 1917, sometimes known simply as Passchendaele, is particularly seared into the national consciousness. The British planned an offensive with the specific aims of breaking through to the Belgian coast to prevent the use of ports by German submarines and, simultaneously, relieving pressure on the French, whose troops had mutinied in April. A precursor to the main assault was the decision to clear German forces from high ground on the Messines Ridge south of Ypres, by exploding 21 massive mines that had been covertly laid deep beneath the German positions. The mines went up in the early hours of 8th June. The blast could be heard in the south of England and the results were predictably horrendous – it is estimated that 10,000 Germans perished in the carnage. Bewildered survivors surrendered in droves and, by 17th June, the objectives on the Messines Ridge had largely been achieved. Two mines did not explode – one is still there, buried under the Belgian countryside. The main offensive – much delayed while generals and politicians argued – did not begin until dawn on 31st July when 100,000 troops went over the top. It was preceded by a massive two-week artillery bombardment during which 4.5 million shells failed to dislodge the Germans but did succeed in further churning up the already fractured earth and smashing the drainage system. What the planners had not foreseen was the worst rain in years. The rain began at 4 o’clock in the afternoon on the day of the attack; by night, the men were floundering. Every stream became a torrent, every trench filled with liquid mud and effluent. The low-lying, sodden ground, already stirred like a gigantic, awful, porridge and full of the detritus of almost three years of warfare, became a ghastly, glutinous, slimy hell where men and horses drowned, became disorientated and simply disappeared. Attacks and counter-attacks came and went until, finally, the Canadians took the tiny village of Passchendaele on 6th November. In three months, the British and their allies had advanced about 4½ miles – the ports of Ostend and Zeebrugge may as well have been on Mars. Casualty figures vary from one source to another – according to historian Martin Gilbert, during Third Ypres Britain and her allies lost 62,000 men with 164,000 wounded and the Germans suffered 83,000 dead with 250,000 wounded. All or most of the ground that had been won was retaken by the Germans in their offensive of March 1918; and then taken back during the allied counter-offensive preceding the armistice in November. After the war, Ypres’ citizens, who had largely vacated the town by 1915, gradually drifted back to their vanished homes and businesses. Winston Churchill suggested that the town should be left in ruins as a memorial; but, thankfully, it was rebuilt – to all intents and purposes more or less as it had been. 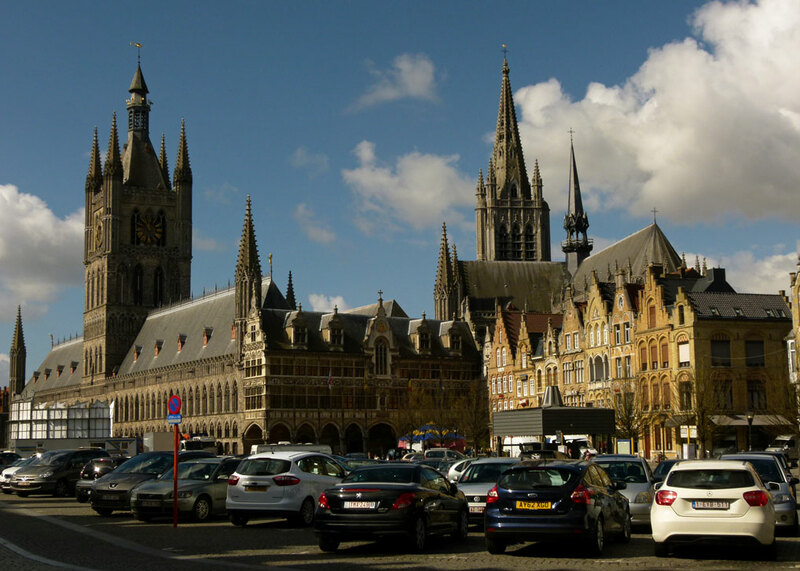 And today, if you didn’t know any better, perhaps you could be forgiven for thinking that Ypres is just a very pleasant, affluent, Flemish town; a good place to sample some of that excellent Belgian beer – as well as the ubiquitous frites and mayonnaise. It is all of that – but you cannot escape what happened hereabouts just a short century or so ago. It seems almost indecent to wonder, not simply at how on earth it has all superficially recovered, phoenix-like, from the ashes of destruction, but also to what extent the area owes its current wealth to those that died; income from war tourism must be enormous. But before you begrudge anyone a reasonable Euro, remember that all of this helps us not to forget – which we must never do. Actually, you don’t need to look far for reminders: the scars of the war that changed the world forever are all around the places where people live and work today; in fact, the old war still manages to kill people sometimes. The first thing that strikes you as you get close to the Ypres Salient is the sheer number of war cemeteries. There are more than 100 British and Commonwealth cemeteries in the area, all beautifully maintained by the wonderful Commonwealth War Graves Commission (CWGC). The distinctive green and white signposts are everywhere. The cemeteries vary in size from a few dozen burials to almost 12,000 at Tyne Cot, the largest Commonwealth War Cemetery in the world. Many of the cemeteries grew from burials outside dressing stations; some – like Tyne Cot on the gentle slope leading to Passchendaele – are even battlefield cemeteries, though most of those disappeared during the fighting that ebbed and flowed over them. All, except possibly the larger ones, have a familiar well-tended country garden atmosphere; light and restful, they are places of peace. It is hard not to stop at each grave and read the inscriptions; hard not to weep; they were just boys, from all parts of the United Kingdom, from Canada, Australia, New Zealand, South Africa, the West Indies, India (including Pakistan) and China. 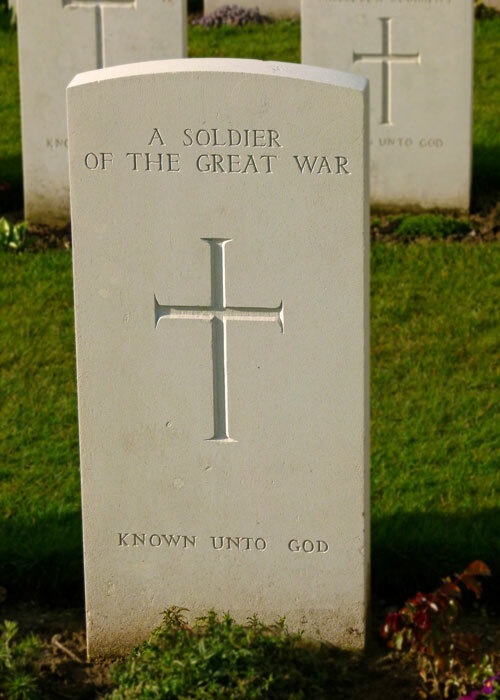 40,000 are unidentified; their headstones inscribed ‘A Soldier Of The Great War, Known Unto God.’. There are two main French cemeteries with the remains of almost 9,000 men in the Ypres Salient, a Belgian cemetery with more than 1,900 burials (including French and Italian) and a German, Langemarck, containing the remains of almost 45,000 men, including a mass grave where 25,000 lie together under flowering shrubs. The sombre atmosphere of the German cemetery contrasts greatly with the Commonwealth sites. 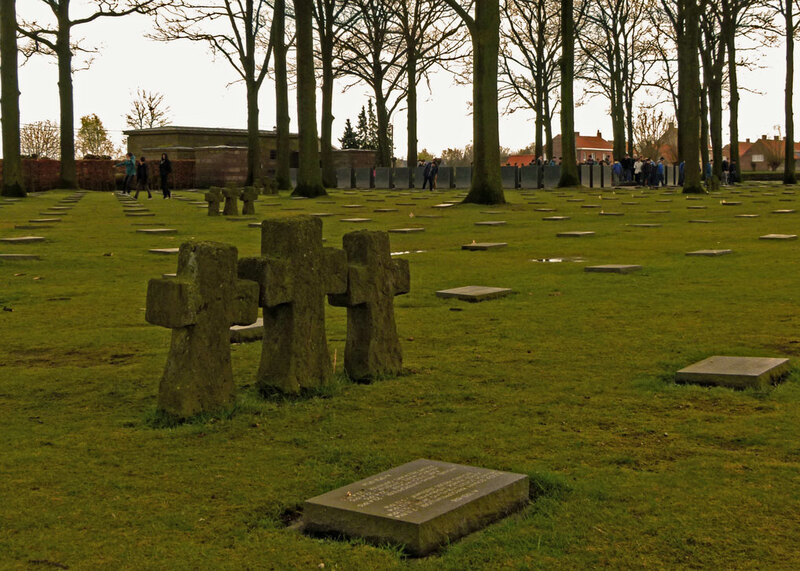 Other cemeteries lie outside the Salient; altogether, the dead of fifteen different nations from the First World War lie at rest in Belgian soil. From In Flanders Fields by Lt Col John McCrae (1872-1918). The countryside is punctuated by concrete bunkers and pill boxes, some accessible, some not. At Hill 60, you get an idea of the war that was fought underground; each side laid mines under the opposing trenches and hundreds, if not thousands, were entombed there. Then there are the memorials, from the national to the individual, large and small: they are everywhere – along roadsides, on corners, walls and in rebuilt churches. Each one tells a story. Some are breathtakingly beautiful; some are very simple. The memorial to the 1914 Christmas truce near Ploegsteert (known to the British as Plugstreet) is a plain wooden cross. There are, of course, museums – many of them. One of the largest is in Ypres itself, the impressive and thought-provoking In Flanders Field Museum inside the beautifully rebuilt Cloth Hall. 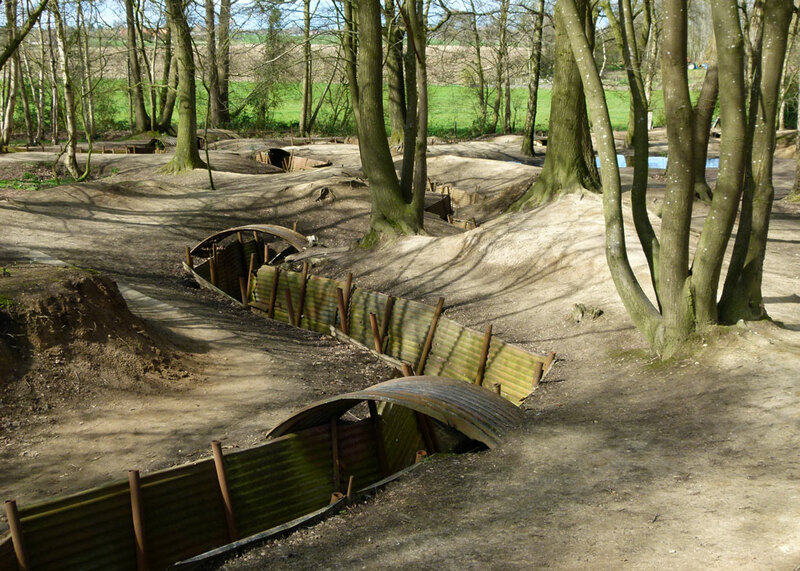 There are smaller, more informal, museums adjacent to preserved trenches, such as at Sanctuary Wood and Hooge Crater – part of an elegant country estate before the war. If you’re minded to, these are the most obvious parts of the battleground to walk on; the reality, though, is that the battlefield is all around you. The museums’ exhibits have mainly been picked up from the battlefields. Some items look almost new, certainly hardly used – the condition they were in when lost or discarded. There is, understandably, an impressive arsenal of weaponry of one sort or another – mainly small arms – helmets, shells – and so on. But then there are all the other things: hideous pieces of shrapnel, shrapnel balls; spent bullets; unused cartridges; grenades, rusty coils of unused barbed wire; pumps; shovels; domestic items, such as razors, combs, bottles, tins, diaries; bits of uniform, belt buckles, badges; in short, the detritus of war. The sheer volume of this material is breathtaking – millions of items – evidence of the intensity of the conflict in this relatively small area over those four years. And it still turns up. 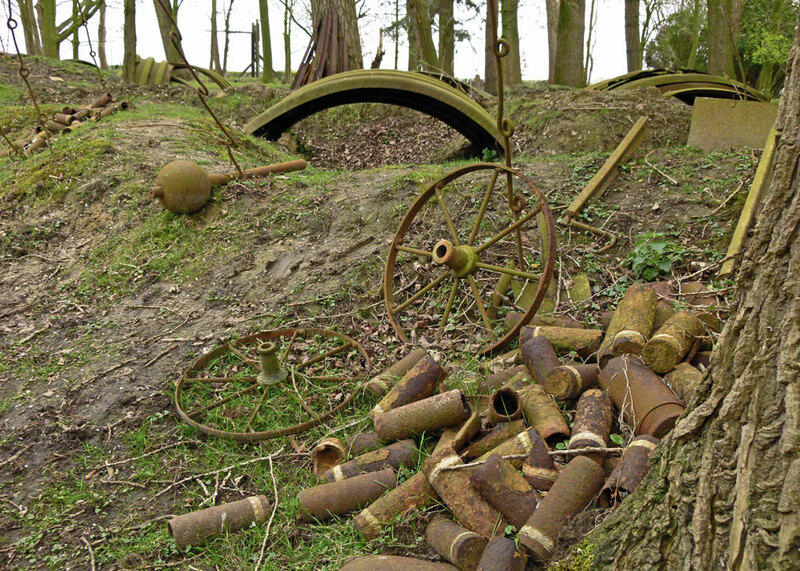 The Iron Harvest as it is called still reaps relics from the battles of 1914-18, often in the form of unexploded ordnance. Just before my last visit, in 2014, two workmen were killed by an unexploded shell in Ypres. The archaeology of the Great War also continues to reveal abandoned trenches and complex command-posts. Sadly, the remains of soldiers continue to be found too, year after year. The nature of the First World War produced a phenomenon that no one knew how to handle: the missing. 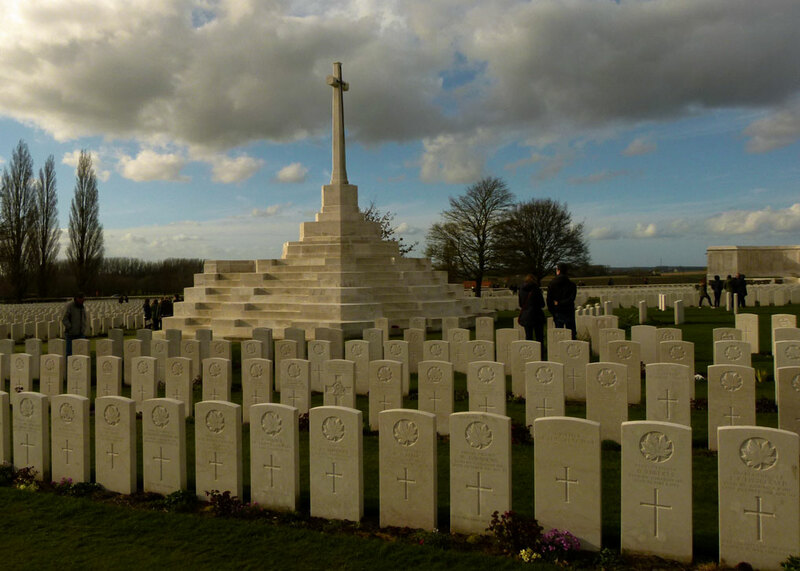 Most of the Commonwealth dead, more than 100,000 men in the Ypres area alone, have no known grave. Whilst many of their bodies were recovered, they could not be identified and the majority were lost without trace – they simply disappeared. At 7.30pm every evening, the traffic is stopped at the Menin Gate in Ypres and at 8pm the Last Post Ceremony is held. It has taken place every night since 11th November 1929, except for the four years of German occupation during the Second World War. 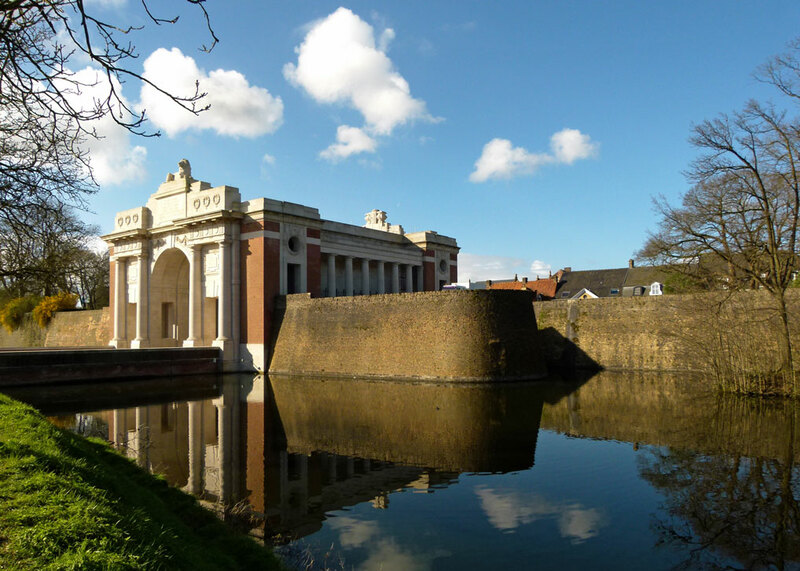 It attracts crowds, young and old, and it is intensely moving – particularly as the Menin Gate is a rather special place. It was here that troops left Ypres to march up to the front and here that the massive Memorial to the Missing was built after the war, designed by Sir Reginald Blomfield. On its walls are recorded the names of 54,000 men from the UK, Australia, Canada, undivided India and South Africa. The numbers mean nothing unless you can picture that many people: it only really hit me the first time I saw the names engraved; each one a life with hopes and dreams; each one a son, a lover, a brother. A further 35,000 men from the UK and New Zealand are commemorated on the walls of Tyne Cot. 1,200 more Kiwis are commemorated at Messines and Polygon Wood and almost 11,500 more British and South Africans at the Ploegsteert Memorial. If you find these numbers difficult to comprehend, try to imagine a packed Wembley Stadium where the seating capacity is a mere 90,000. And remember that these figures are just for the Commonwealth and in one small area of the conflict. It is a shameful fact that no one knows exactly how many died, of all nations, members of the armed forces and civilians, during both World Wars. In the Ypres Salient between 1914-18 somewhere between 450,000 to 500,000 fighting men perished; maybe half were never found or identified. So that’s a bit about Ypres, known as Wipers to the British Tommy. It is not in Britain, but Churchill said of it – “A more sacred place for the British race does not exist in the world”. For information about visiting battlefields, you can do no better than Major & Mrs Holt’s guides. The Commonwealth War Graves Commission’s website is the essential source for researching the Commonwealth fallen, and an interesting site in its own right. There is so much printed and other material available about the First World War, some of it excellent, but I cannot recommend Lyn Macdonald’s books too highly, available from Amazon. She took first-hand accounts of the conflict, from interviews, diaries and letters, and, with skilful editing, turned them into masterpieces of historical narrative; it’s like looking through a window into the past. Thanks Rick! Another moving item for your bucket list, if you haven’t already made the pilgrimage, is the American cemetery overlooking Omaha beach in Normandy. What a moving tribute to The Great War and the people who fought it. I learned so much from this post! Thank you, Joy; I appreciate that. It’s impossible not to be moved there. Our youngest son, who studied History, visited Ypres. This is a very moving and so timely post Mike. Thank you for sharing this post. I’ve visited Ypres a couple of times now and would go again at the drop of a hat. There’s something so peaceful and serene about it, despite what happened there. Yes, there’s something about the place that draws me back too. Thanks for dropping in and leaving a comment! Thank-you so much for this wonderful post, Mike. My husband would agree with you about Lyn Macdonald’s books; he used to have a few but had to let them go during one of our purges. We have been meaning to visit the battlefield sites in Belgium and France for some years now – we just can’t find the right time! How fortunate we were in not having battles fought in our country during WW1 and WW2. Thanks, Clare. I find I re-read Lyn Macdonald’s books. I highly recommend a trip to the Western Front; it’s so close. And you’re right, the UK got off relatively lightly compared to other countries. Very well done. Our kids went to John McRae School and we lived around the corner from the McRae house, so we heard a lot about Flanders Fields. Thanks, FG. Yes, he was from Guelph wasn’t he. Hard to read – but appropriate on our Veterans’ Day. You told the story well. This reminds me of our visit to the Somme this past spring where my own great grandfather died in World War 1 and is buried there. Thanks Mike. Never forget is right. Horrible, horrible, unimaginably horrible. So many unknowns – I didn’t realize. But Belgium will never forget – the tending of the cemeteries and the daily ceremony – what a sobering post. But November is the month to remember the dead, so – thank you for this reminder. Thank you, Mike, a very moving post. I will be passing this one on to the boys. Our Sam has the honor to speak our our local Veteran’s Day Memorial Service on Friday. Sam wrote a speech on the theme ~ Voice of Democracy. That’s a HUGE honour, Carla; hope it goes really well – maybe you could publish some photos. “Hard not to weep”…Mike, I can only say that you must have taken a great deal of time to write this, it is truly moving. Thank you. A superb tribute, Mike. Most timely, and an appropriately apt inclusion in your series. Rupert Brook would have approved. So moving. One wonders how any of those who returned alive had anything approaching a normal life in the years that followed their war experiences. A very timely post for Veterans Day in the U.S. this weekend. Yes. Thousands were still drawing disability pensions on the eve of WW2. Some never recovered mentally, let alone physically; how would you ever be the same again? This was a beautiful, thought-provoking post. Thank you for this. I took a moment to say a prayer for all the lives lost. Thank you, Darlene; and thank you for dropping in and leaving a comment. Well written but so very sad. all tyrants and bureaucrats should be made to visit such places yearly. Maybe we could also stick them in a locked room to settle their differences and leave the rest of us to get on with our lives. Much of my country’s history there too. Such a moving post. Thank you. Thank you for such a sober, moving post. My father lost all his older brothers in that war….their loss turned his mother from a happy laughing woman into a grey wraith…. When living in France we used to go through that area to visit family in Belgium and it cast a pall of sadness every time. Some of the most touching cementaries are the tiny ones…so well maintained. If only those who lie in them could have enjoyed the peace that now reigns there. That’s horrendous – ALL his older brothers?! I agree about the smaller cemeteries. It altered a whole way of life. A very moving and disturbing post, Mike. So much killing. So much destruction. Will the 21st century be better? I actually think that mankind is progressing, but we still have a way to go. A place I must see for myself someday, with so much of my country’s history there- Passchendaele’s centennial particularly looming right now. I’ve been looking in at something here that’s been going on since September and ending on the 10th- the illumination of names of the dead from over a dozen countries in 1917 on one of our buildings. Other countries are doing it as well, including Britain. Thanks, William; I’ll make a point of looking for that. It might be too late now for you, since there are several hours time ahead for you, but I’ll post a link for the site into my post- I’ve got something scheduled with it on Sunday. haha! comments not in the reader, but can comment here on the actual site! Fabulous post, thanks! This is such a beautifully written moving post Mike. I have tears in my ears and a lump in my throat. I can’t even begin to imagine the hell those poor wretched soldiers went through. We must never forget the brave men and boys that fought for the freedoms we enjoy today. Thanks, Polly; I can’t imagine what it must have been like, either; we have so much to be thankful for. Thanks for a very timely and moving piece. Thanks also for the book recommendation- I’ve been wanting to find a good one for this time period. Thanks, Anne. Each of Lyn Macdonald’s books features one aspect of the conflict. Martin Gilbert did a good, general, history on the war – but there are loads, of course. Hmm – they may not be as available in the US – maybe on Amazon. Know what you mean – I pile books up too!